To provide truly successful dental care, the dentist and his team must keep in mind that they are treating more than just teeth. They are treating patients. At Fate Family Dental, we realize that each person who walks through our door has unique needs and circumstances and that they all deserve to be treated not just like patients but like valued friends and neighbors. Oral health is crucial, but so is the patient’s comfort. To help provide each patient with the best experience possible, Dr. Andy Davong and Fate Family Dental have assembled the finest staff of friendly, experienced and caring dental professionals. Together, the staff takes pride in serving the Fate, Royse City, and Rockwall communities. Dental care begins and ends with patient comfort. 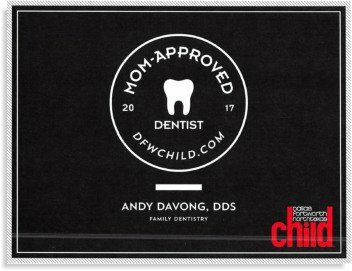 Dr. Andy Davong takes that philosophy seriously as well as his responsibility to stay current on the latest advances in dental treatment and technology. Dr. Davong obtained his Doctorate from Baylor College of Dentistry in Dallas, TX, and continued his education through several post-graduate courses in various specializations. In addition to being an accomplished practitioner of general dentistry, Dr. Davong also has experience in fields ranging from restorative dentistry to cosmetic dentistry. He is a member of the American Dental Association, the Texas Dental Association, and the North Texas Dental Society. Since each patient is different, Dr. Davong insists on starting each examination by listening to his patient, making sure to connect with them and to understand their dental concerns. After completing a thorough analysis of the patient’s teeth, he educates the patient on their specific diagnosis and discusses potential treatment options. Because patient comfort is so important, Dr. Davong wants to ensure that each option is available and that the patient is happy with the course of treatment. The same respect and concern that Dr. Davong brings to each patient also trickle down to the entire staff. Each member of the team will treat you with professionalism and will draw upon years of experience and knowledge in the field. We do more than clean and restore your teeth, we look forward to getting to know you, treating you personally, and providing you the sort of friendly service that can make your visit to the dentist an enjoyable experience.